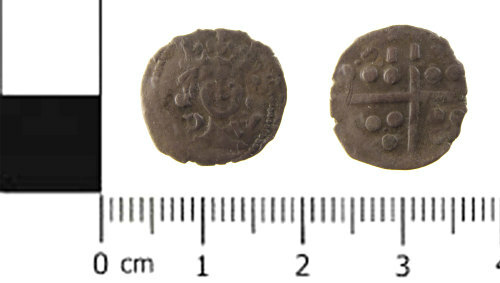 A Medieval silver coin; a penny possibly of Edward IV, 2nd reign (AD 1471 - 1483) issued under Bishop Dudley and dating from AD 1476 -1483. Mint of Durham. The coin is 14.6mm diameter and 0.7mm thick. 0.74g. The coin is worna nd heavily clipped. One quarter of the reverse is slightly double struck. See North number 1666 in Volume II, page 95.